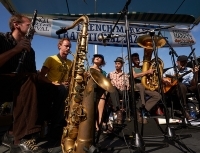 Priding itself on being the largest free music festival in the southern states, the annual French Quarter Festival is a showcase for local musicians and a chance to savour New Orleans' gourmet flavours. On the music front, 21 stages and over 800 musicians operate in the historic Vieux Carre district with a diverse programme ranging from brass bands to gospel and traditional jazz. On the food front, over 65 popular local restaurants are invited to contribute to the 'world's largest jazz brunch', which features a smorgasbord of New Orleans specialities. These include jambalaya, gumbo, and bread pudding. Other special events around the festival include fireworks over the Mississippi, art exhibitions, courtyard tours, music workshops, and parades.